The third rate, or “74” (from the number of guns aboard), is a supremely practical weapon of war. With a crew of around 700 men, it is a “wooden world” in itself and a statement of national power. A two-deck design, it is strong enough to mount very heavy cannons on its lower gun deck, often 32-pounders. With 18-pounders on the upper gun deck and then 9-pounders in the upper works, it has a devastating broadside. The design and construction means a 74 can withstand horrendous damage in battle. 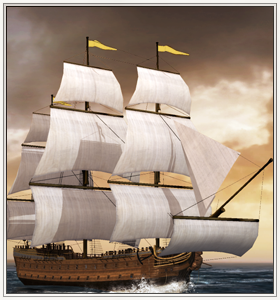 Historically, the French invented the concept of the 74-gun ship in the mid-18th century. The design was so good that other navies lost no time in copying it or in capturing French ships. French vessels, while well designed, were often made from green timber that “worked” in heavy seas and therefore leaked. Dutch examples had a shallower, broader draft to suit their harbours and shore waters. The few American 74s were extremely strong and well made. British 74s were well constructed too, although there was a regrettable tendency to save money by recycling timbers - complete with timber rot - from older vessels! Amazingly, HMS Implacable, the last of the third rates, was scuttled in 1949! Built in 1800 by the French, and captured at Trafalgar in 1805, she stayed in service until 1842. Eventually, she ended her days as a coal hulk.